DONATE DIRECTLY TO UNICEF HERE! Last year, VideoYEAH held its very first Moore-athon for UNICEF. It came about in response to a plea by UNICEF ambassador Roger Moore for donations to aid relief efforts in the Horn of Africa, which had been hit hard by drought and famine. VideoYEAH held a 12-hour marathon of the films of Roger Moore, and the whole event was streamed live via webcast. We were able to smash our short-sighted $100 goal within minutes and went on to raise over $720 (which was matched dollar-for-dollar by the Canadian government)! On Saturday, November 17, 2012, members of VideoYEAH will be sitting down from noon to midnight to watch six film (and one TV episode) featuring Roger Moore. We will be live streaming the event (NOT the actual films) right here on VideoYEAH. So please join us, chat with us, ask questions and most of all DONATE. Let us know which of these three golden choices you’d like us to watch in the comments below. More information, including where and how to donate, will be added to this page as we approach the day. Check back for more info! A: Moore-athon 2012 is a fundraiser organized by members of VideoYEAH to raise money for UNICEF. A: Saturday, November 17, 2012 from noon to midnight, EST. A: VideoYEAH members will be holding a 12-hour marathon of films starring Roger Moore. We will be streaming the event live throughout the day, encouraging people to donate to UNICEF through our fundraising page. A: Roger Moore is a Goodwill Ambassador for UNICEF. He is also seriously cool. A: Last year, Mr. Moore made an appeal for people to donate to UNICEF to aid children in the drought-stricken Horn of Africa. There are some big Moore fans at VideoYEAH, so we decided to hold our 1st ever Moore-athon. Our initial goal was to raise $100, but we quickly blew that goal out of the water (in the first hour) and went on to raise $720 (CAD). We were so overwhelmed by the response that we decided to do it again this year. Q: Are you streaming the films over the internet? Isn’t that illegal? A: Yes. That’s why we aren’t doing that. During the live stream, viewers at home will not be able to see the actual films, but will instead be able to watch us watching the films. Viewers are encouraged to chat this us, ask us questions (try to stump us! ), keep us company and even watch along at home with us if they choose. A list of the films are presented above, so you can get your copies out at home. A: You can donate to UNICEF through our fundraising page at the UNICEF website. UNICEF will handle all transactions and issue tax receipts. Q: Are they any other ways I can help? A: Yes! You can tune in to our live stream on November 17, 2012 right here at VideoYEAH. You can help spread the word by clicking “Like” our Facebook page and following us via Twitter @mooreathon. Help spread the word! Q: Are you affiliated with UNICEF or Roger Moore? A: Nope. We are affiliated with neither UNICEF nor Roger Moore. We’re just a bunch of dudes who like watching movies and helping out people in need. 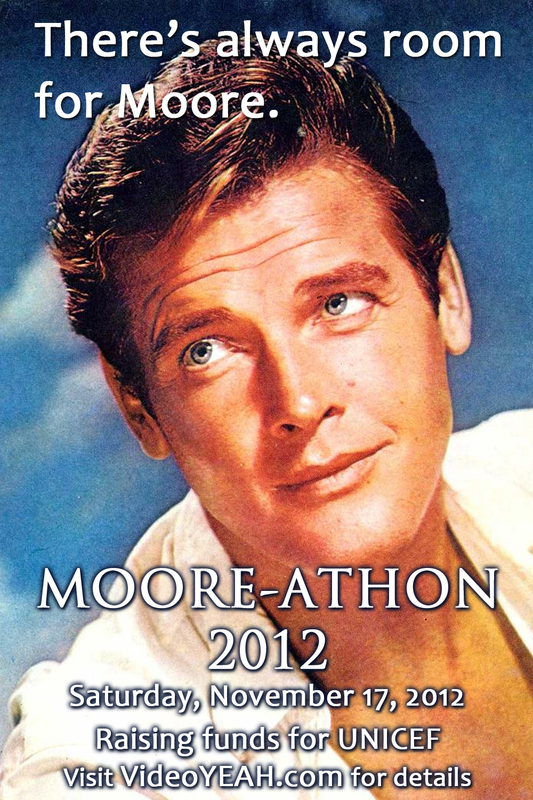 Is there anything else you’d like to know about Moore-athon 2012? Ask us in the comments below or at mooreathon@videoyeah.com. Man with the golden gun…..
Pingback: Moore-athon 2012 this Saturday! « VideoYEAH! Man with the golden gun…indeed. Pingback: Moore-athon 2012 « VideoYEAH! Pingback: Moore-athon 2012 Raises $450! « VideoYEAH!